I admit to being a perfectionist (when it suits me). The square-in-a-square block is one of those easy looking units that never comes out quite right. In other words, WONKY. But no more wonky! I have come up with a way of achieving bliss perfection, at least on this particular block. Don’t worry, my perfection pretty much ends right there – just ask my family! Getting this placement right is probably the trickiest part. The center point of the triangle should be facing the middle of the square. The triangles are over-sized so there is some wiggle room here. Step 6: Repeat steps 3 – 5 on remaining two corners. Step 8: Remove freezer paper (which can be used again) and admire your beautiful and accurate block! You have the option of trimming away the base fabric corner after sewing and trimming each corner triangle. This time I chose to keep mine on for added stability, but normally I would trim it away. If you use a scant 1/4″ for your piecing, you will love how this block fits together! If you want to use this method for different sized blocks, I have come up with a chart based on the unfinished size of the block. These are the most common sizes, however I stopped at 6 1/2″. If anybody wants larger sizes, you can leave a comment or email me, and I’ll work out the numbers. Updated 10/2013 – chart has been corrected and updated from original post. *Note: The cut sizes with a “+” means to cut slightly larger than the specified size. So, 2 ¾”+ would be in between 2 ¾” and 2 7/8”. And in my Fat Quarter Shop 2012 Designer Mystery BOM Block 1, which I posted about here. Now I get beautiful match points on all of my square-in-a-square blocks! Funny what a quilter will get excited about. I know I’m way late, but wanted to say a big thank you for this SIAS tute! I love this for stars and borders and you’ve just taken the anxiety out if it for me. Yea! Thank you Julie, I tried out the block. Now I need to make a 12.5 unfinished square in a square block – – help! I also need flying geese to go with the square in a square block with no seam in the center of the flying geese? Great tutorial. I tried it out and love the result. 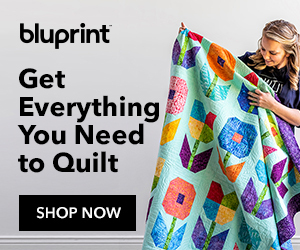 I wish I had known about this for my daughter’s Quilt! I found that it helped to mark the mid point of each side of the freezer paper with a small crease. When I aligned the triangles to the freezer paper, I creased the mid point of the hypotenuse very carefully to avoid stretching the bias. Lining up the two midpoints helped me position the triangles quickly. Thanks for your practically perfect posts! I want to do a square in a square in a square with three squares that is 8 inches. Have you done one like that and what measurements did you use? Oh my goodness! I am so very grateful to have found your technique! I can’t wait to try your method and will do so this week. I struggled with my own method just last week and trust me, mine was not pretty. haha I even asked a friend to help me figure the sizes to make a 10.5″ finished block to no avail. I cannot thank you enough for the different sizes chart you so graciously share with your followers! Beautiful blocks are in my near future, thanks to your instruction. I want to do a 7.5 square, what size center square and what size for corner squares? Thanks so much, I love your method. Help! I need the unfinished outside square to be 12 and 1/2 and finished at 12. I don’t care what the inside square is as long as the points are nice. Woah this blog is magnificent i like reading your posts. Stay up the great paintings! You recognize, many people are looking around for this info, you can aid them greatly. Thank you for posting photos to show your square in a square block. THANK YOU for this tutorial!!! I have a quilt I started 3 years ago that I haven’t finished because I couldn’t get perfect square in square. There is 12 of them in this quilt. Now I can finish it!! THANK YOU!! I love this tutorial. Your pictures are great and the concept is brilliant. I intend to try it the next opportunity I get. I quickly read through the comments and didn’t find a discussion of why you don’t trim off the extra base triangle portion. Can you explain why you prefer to keep it on? I’m curious. Thanks. Great question, Camille! I’ve updated that portion of the blog post to share my thought process (which changes over the years)! Great explanation of how to do this well – thanks!! I’m making a 54 40 or fight variation with a square in square center block. What about a 12″ block? I have alot of 4″ precut squares to use. What would be the sizes of the others squares that I would need? I finished making all my squares and am now concerned whether joining ten of them together will be a problem. It seems like there may quite a bit if bulkiness where the points come together in the seam allowance. Any tips regarding this? Also, is this a case where I would be better off pressing the seam open( to reduce the bulk), rather than pressing to one side? Any insight you have into this would be appreciated. You can press seams open but I find the best way to reduce the bulk is to press half the seams one direction and the other half go the other direction. I like to be able to lock my seams together to get a nice crisp joined area. Hi Julie, thanks for the great tutorial, love your Perfect Square in a Square, and I am so happy to have found your blog! Thanks so much for this excellent tutorial! I have to make 28 of these for the quilt I’m making. For a beginning quilter this seemed daunting. Thanks to this post my squares will be more accurate and I see it as a real time saver, too! Thank you for the tutorial. I am making a storm at sea quilt and need a 4 1/2 unfinished and a square in a square in a square 8 1/2 unfinished. I am having trouble with the 8 1/2 one. I will use your measurements and technique for the 4 1/2 one. Any help you can give will be appreciated. Hi. I would like to try your method for square in a square but need to make 8.5″ unfinished blocks. What measurements would I use for this size? Thanks so much in advance! Thank-you so much for these wonderful clear do-able instructions! This method just makes so much sense and I have a whole box of freezer paper. I appreciate you sharing and posting this tutorial. Thank you for sharing your love quilting with such attention to detail! I am so grateful that you have posted this tutorial. I am beginning to make a quilt for my daughter who just got married. It is blue and white and accurate piecing will be very important. I am looking forward to using this promising technique. I really like your method of making square in a square blocks. I’ve always used the stitch and flip method, but have trouble getting all the blocks to turn out the exact same size. Do you have any suggestions for sewing a square in a square block to another square in a square block? I just made a quilt top where I had to do this and I had a terrible time getting the “points” to match up. Hopefully this makes sense. I was thinking that there’s got to be a secret to making it work. Thanks for your help! The best way to get your points to match up is to use a “setting pin”. I have a picture of it on a previous post: Quarter Square Triangle Tutorial and a description of the process. It’s towards the end of the tutorial. I hope that helps. Thanks so much for your reply. I do use a setting pin, BUT, have never tried pinning on either side of the setting pin. I will definitely try this next time. Just discovered your website and I love your ideas! Julie, your method is fantastic! I am making the blocks right now and your method is resulting in perfect blocks. Thanks for showing me a wonderful new method to make these blocks! I’m going to be doing a 4 3/4 base square. could you please send me the measurements for the corner triangles and freezer paper size. Thankyou so much for your help. For a 4 3/4″ base square, you will need a 3″ center square for the freezer paper and 2 squares at 3 1/2″ cut in half diagonally for the corner triangles. Good luck on your project and let me know if you have any other questions. Thanks for the Sq.in Sq. tutoral, very helpful!! Thank you for the great tutorial! I always have trouble with this block, and can’t wait to try your version! What a great little way to make these blocks!! What a fantastic tutorial! I’ll definitely try this the next time (the first time, actually) I have to do a square-in-square block. Thanks for the chart of a variety of sizes, too! Brilliant Julie! I just loved your Mystery Quilt BOM pattern you used this technique on, and will try it. Thanks for posting the Square in a Square cutting chart, it will be a pleasure to use:-) after a week of muscle- building digging in the garden…weeds have a habit of taking over in a summer- Norway climate, I’m delighted with a rainy forecast for the next few days (gives the weeds another boost!) and have my sewing machine oiled up and ready to go! Ps I have my flight booked for September in Sunnyvale, so hope you have a class planned at the Granary! I feel almost as if this was a private lesson for me!! Thank you so much. I can’t wait to try this technique this afternoon. I think I need to get the paper first. I have heard other people using the paper for different quilting projects but this is the first time I see it “action”. You are so kind to take the time for the tutorial.